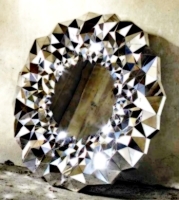 Encountering a seemingly innocuous faceted mirror bearing what seems to be a faint enchantment, those who look upon its strangely faceted surface find themselves translocated to a horrific parallel dimension that succumbed to Cthonic infestation at some point in its own continuity. Whether the victims are actually physically present or simply experiencing a shared delusion is not clear, but deadly sanity-crushing terrors await them nonetheless. Time and space seem bent and some aspect of the physics of home don't seem to apply. Anachronisms from the near past and future can be found, as well as strange magic and technology. The poor lost souls must gather Forbidden Knowledge and make a daring escape...or perhaps be doomed to this insane purgatory and its deadly Cthonic denizens. The setup for this vignette is incredibly easy. Simply make sure that the Hunters somehow discover the Mirror of Tomorrows Passed, bait the hook, and let their curiousity do the rest. To make it less obvious, you can easily embed the aritifact amongst a few other aritifacts, the accoutrements of a Mystic the Hunters have defeated, or even as the "MacGuffin" of a Hunt unto itself. Presumably the Hunters enjoy their approximately sane existance in a dimension that is not infested with tentacled Cthonic things burrowing through reality like boll weevils in bread. The carrot is the desire to return to their own dimension. The logical ramifications of not escaping the Cthonic-infested dimension should be stick enough. Act I occurs whereever it is convenient to the plot. Act 2 and 3 occur in a doomed parallel dimension that was once much like that of the Hunter's home dimension, but long ago fell to unspeakably terrible Cthonic beings. Bryr'thept: disgusting writhing tentacled worm horrors. Fast and dangerous. Krythoths: semi-humanoid tentacle-faced abominations. 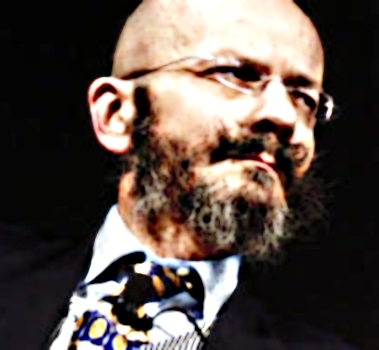 Some believe that they were once humans who have been grotesquely altered. Uarg'roth: gigantic, immensely strong hunter-killers. Fortunately, they are solitary hunters. Takes x2 Damage from crushing / blunt weapons. Attacks using Strength and standard maneuvers. Takes x2 Damage from edged weapons. The head generally remains submerged, appearing only when dramatically appropriate. Similarly, the Q'gthik will re-submerge and exit the scene when the Hunters have destroyed at least 4 or 5 tentacles, or earlier if dramatically appropriate. For purposes of determining attack order, each tentacle gets 1 action, but organize tentacles in groups of no more than 12 and stagger their collective actions across a Turn as if the group has SPEED equal to their number. Thus 1 tentacle goes on Phase 12, while a group of 2 tentacles goes on Phases 12 and 6, a group of 3 tentacles goes on Phases 12, 3, and 8, and so forth. When a tentacle is destroyed, the group of tentacles it belongs to loses its next segmented action. NOTE: Against most Hunter teams groups of 3 or 4 tentacles are recommended. Cannot be truly killed, unless the phylactery that holds her existence to this plane is destroyed in which case she fades away to nothing (see Act 2). She is usually Desolid, but can become corporeal (and invulnerable) for short periods of time. Can destroy 2 Cthonic creatures with 750 character points or less per Turn, though this tires her out for the day after 1d6+1 Turns. Cannot wander further than a mile from her phylactery. Cannot physically interact with her own phylactery. NOTE: Mallory is an important ally for the Hunters. Any reasonable, simple effects needed to make for a better encounter. Virtually Immortal: Is not permitted to die by his masters. Completely Nullified / cancelled by being within 20 feet of Jules Ablefors' remains (see Act 2). Profane Regeneration: Regenerates 1 BODY per Segment. 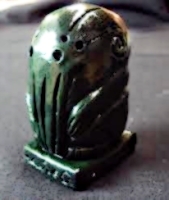 Tentacled Horror: If reduced to 0 BODY, erupts into the equivalent of a Q'gthik with a group of 3 tentacles and a group of 5 tentacles; the "head" is Nikolai's face on a bulbous mass. Favored Invincibility applies to all tentacles and the head if not cancelled by Jules Ablefors' remains. Nikolai will revert to his version of "normal" after 2d6 hours. NOTE: Nikolai is the big bad, but is a talky semi-tragic villain. Rather than playing him as a straight combat monster, consider adding some gravitas and pathos and chat the Hunters up a bit before things devolve into violence. It will be more memorable in the long run. The Hunters can attempt to barter with Nikolai to use the Heart Stone to return to their dimension, but this is a foolish thing to do. For despite all the hand-ringing about his poor dead wife and his sad sad tale of woe, Nikolai is truly and completely corrupted by the dark Cthonic powers he has served all these long years. The Hunters opting to barter to use the Stone to go home simply makes Nikolai and his Cthonic masters aware of the Hunter's dimension...the downside of which should be obvious. The Cthonic monsters are under the command of Nikolai in theory, but there are far too many scattered too far for him to direct and control. Thus, most just wander, hunt, and fight each other. Assume that all Cthonic monsters encountered in Act 2 are essentially (semi-)random monster encounters. Once Nikolai becomes aware of the Hunters in Act 3 however, most if not all Cthonic monsters encountered will be actively hunting the Hunters. Act 1 of this vignette is freeform and will vary greatly based upon the events in play. Typically, this vignette would be spliced into or between other vignettes or adventures upon the Hunters stumbling across the artifact known as the Mirror of Tomorrows Passed. Thus, it is left to the GM to arrange or contrive the lead up to Act 2 as best suits their campaign. As soon as the Hunter(s) become victims of the mirror and are translocated to the Cthonic dimension, Act 2 begins. The Mirror of Tomorrows Passed is a potent mystical artifact connected to an alternate dimension that fell to Cthonic forces. Though it is normally inert, when subjected to mystical scrutiny there is a chance that the artifact will "wake up" and entrap those who's gaze it arrests. Those unfortunate enough to become its victims are sucked into the dimension the mirror acts as a portal to, where insanity-inducing Cthonic creatures wander and the few surviving mortals subsist like sewer rats, hiding as best they can. To enable the GM to splice this vignette into their story, the origin of the Mirror is left undefined. If the question comes up during play and you as the GM don't have a more tailored idea, a good default answer is that it's really a general gate to other dimensions not keyed to any particular "other end" and that the Cthonic dimension the Hunters ended up in was essentially random. This means that the Mirror can be used again for future unrelated adventures. Once in the "other place", the victims must quickly adapt or face unspeakable horrors. Strange Sensations - Environmental effects. The greenish tinged mist feels unnerving, cold, clammy, and invasive. The air has a pungent, fetid smell. The ground is mushy, soggy, and mossy. It is difficult to see in the dim hazy light. And the gigantic roiling tentacles far above in the cloudy sky fill almost everyone with understandable dread. In several of the significant locations of this vignette there can be found Cthonic Idols which act as nexus points for the Cthonic horrors to infest the area. While the portals exist, Cthonic horrors will periodically emerge from them making them quite dangerous. Unfortunately they are quite difficult to damage. It takes 50 Strength to even budge them (and assume -10m KB also), they have Supernatural Resistance: 30, Physical and Energy Damage Negation: 10, and 20 BODY. Each Segment that the Hunters are in the vicinity of a functioning Idol roll 1d6. If a 1 is rolled a Cthonic creature of your choice emerges from the portal. While it is difficult to destroy a Spawn Portal via direct violence, they can be removed or neutralzied by other means. 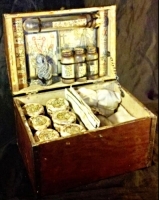 One of the items the Hunters can find at the The Three Remains location is a Alchemical kit that contains enough material to destroy six spawn idols, following the directions precisely and succeeding at a KS: Alchemy skill roll with a -2 penalty. It takes a Minute to mix and apply the concoction, during which time the Alchemist is at 1/2 DCV and very vulnerable. Additionally, Daemonic Wards and Circles encircling an idol effectively neutralizes it as the things emerging from the idol become trapped in the Ward and can't exit. However, obviously, a Mystic attempting to draw a Circle much less a much slower to make Ward around the idol would be extremely vulnerable, and would need either good luck or a comptetent gaurdian while they did their work. Throughout the course of the vignette the Hunters will have the opportunity to find and learn Forbidden Knowledge. In fact, if they hope to escape, they have to learn some Forbidden Knowledge. Unfortunately for Hunters however, learning such dark lore is dangerous. Each time a Hunter learns a bit of Forbidden Knowledge, they must make an EGO check. If they fail the roll, the Hunter suffers 1 EGO damage and 2d6 STUN (Supernatural Resistance and Mental Defense applies, but other defences do not). For each 5 EGO damage taken, the Hunter also gains 5 points worth of a Psychological Limitation; either one of their existing Psychological Complication gets worse, or the Hunter must take a new 5 point Complication. This can take the character over campaign maximums. There are seven significant areas in a five square mile vicinity of the Entry Portal Stone. Six of them are locations where some combination of useful information or Mystically significant items (referred to collectively as Forbidden Knowledge herein), or the remains of prior investigators or persons of interest, or some other useful thing that will help the Hunters figure out what is going on and hopefully escape. There's a Road (more like a glorified trail at its current stage of disrepair) that leads more or less from the clearing the Hunters emerge in and winds generally northward towards a creepy old Manor and its estate, neatly tying the significant areas together. This is not by coincidence. The Entry Portal Clearing: a small clearing amidst a copse of scraggly trees. This is where the Hunters emerge. An overgrown trail leads more or less north towards a large manor house distantly visible. The Three Remains: the scattered skeletons of what seems like three people with a cursory bone count lie along the side of the road about a quarter of a mile from the entry portal. Whatever killed these people did not seem to be interested in their possessions. This is the first location where the Hunters can get a clue as to what the hell is going on. 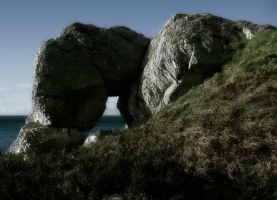 The Stone Door: between the Entry Portal and the Manor, the Road strays near a lake, where a strange outcropping of rock forms an archway like a stone door. The Gatehouse: the abandoned gatehouse, at the edge of the Manor's estate. 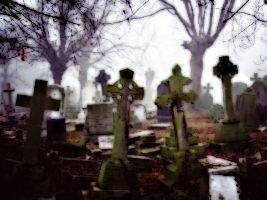 The Graveyard: on the grounds of the Manor, but a respectable distance from the big house, behind a concealing screen of overgrown trees. The (plot significant) mortal remains of Nikolai Wurzelhoffen's long dead wife are buried here, among other people. The Manor House: a dilapidated gabled-roof old manor house stands forlornly amidst creeping moss and tumbledown hedgerows. This was (and is) the home of Nikolai Wurzelhoffen, an occultist who dabbled in the wrong mysteries and was directly responsible for this dimension's fall to Cthonic depredation hundreds of years ago. Moving into this area transitions to Act 3. The Manor Tower: this is the way out. 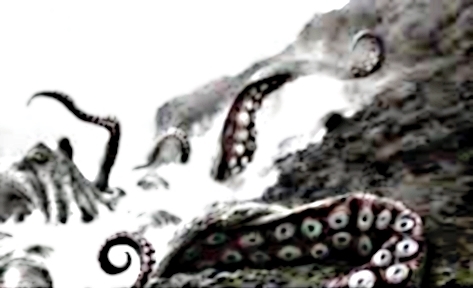 Upon first "awakening" to their new surroundings in a small woodland clearing, the victims find themselves in a dark, gloomy, damp, and perpetually overcast place with a faint greenish-tinted mist or fog, and up in the skies enormously vast roiling tentacles can be seen undulating above the cloud layer as if unimaginably huge tentacled things hang in space and encircle the globe in their noodly appendages. 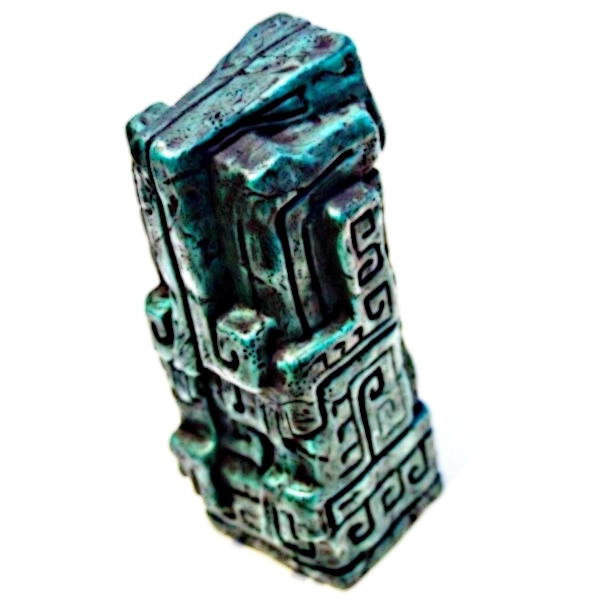 At their feet, embedded in the ground, is a glistening green stone idol or monolith. To supernatural senses it glows from within with daemonic magics. Those who make an appopriate Lore skill roll by a fair margin will sense that it serves as an dimensional anchor. The portal stone is extremely durable and difficult to move. Unless the Hunters have some truly unusual means at their disposal, it is assumed that they cannot meaningfully affect the portal stone. The portal stone is not important as anything other than set dressing. Don't let your players get bogged down on messing around with it, otherwise they might spend an inordinate amount of time just standing around where they came in trying to force the widget to take them home, or trying to break it, or whatever. If need be remind them to look over yonder, at the road that takes them to further adventure. The scattered skeletons of what seems like three people with a cursory bone count lie along the side of the road about a quarter of a mile from the entry portal. Whatever killed these people did not seem to be interested in their possessions. This is the first location where the Hunters can get a clue as to what the hell is going on. Among the scattered detritus are several ornate wooden and metal shod boxes that have survived the toll of time. One of them is the Spawn Idol destruction kit described previously. Another contains numerous notes and mysical implements, and the Journal of a Mr. Thomas Azillo, Esq. who was apparantly an Alchemist and Wizard who thought somewhat highly of himself. The journal is considered to be Forbidden Knowledge. Learning it consists of reading it. The journal describes the existence of a rogue Sorcerer named Nikolai Wurzelhoffen who was obsessed with drawing power from various extra-planar entities by opening portals to a far distant plane of existence of an alien nature. The Cthonic entities of that plane are particularly horrid, but Nikolai was seduced by dark promises of power. However, eventually Nikolai's predations weakened the very fabric of the dimensions reality and other workers of note began to realize what was happening. But they acted too slowly, and Nikolai opened several large portals to allow Elder Cthonic things entrance. Towards the end a group of fifteen gentlemen and one lady who each had extraordinary supernatural abilities enleagued with one another to make a final, deparate attempt at destroying Nikolai and stopping his meddling with Cthonic beings before it was too late to close the portals and expel the elder things that threatened to ruin the world. Presumably they were not successful. According to Tom's final journal entry the team planned to translocate themselves, using Nikolai's own dimensional anchor as their means of ingress. However, it looks like poor Tom and two others didn't make it very far and died here. Various notes scattered throughout the journal detail the Cthonic horrors Tom encountered, and thus the GM can foreshadow them a bit. A Natural Archway...Or Is It? A strange stone archway is formed by a rock outcropping overlooking the water, thirty yards off the road between the Clearing and the Manor, when the trail creeps close to a black-water lake. Nestled within the stone arch is a Spawn Portal Idol, and the area is rife with hideous krythoths who waste no time attacking. Further, the dark oily waters of the lake are home to a giant tentacled Q'gthik which will lash out and attempt to ensnare anyone getting too close to the water's edge. The dimensional boundary between this plane and that of the Cthon is particularly thin here, and historically it was via this (un-)naturally occuring weak spot between the dimensions that Nikolai first made contact with his eventual masters. About a mile beyond the Stone Door, the Road winds around a bit and approaches an old stone gatehouse enshrouded in the encroaching vegetation. Approaching the gate, it becomes apparent that the gatehouse door is shredded and smashed in. Inside the doorway, in the shadows, is a gruesome scene of a hunched eight foot plus tall monstrous and inhuman many-limbed skeleton collapsed on top of a smaller human one. The monstrous skeleton has a large dagger buried in its ribs while the human skeleton's chest is crushed. Presumably the human, whomever he was, managed to kill the monster before expiring of his own mortal wounds and the two joined each other in death. Killing Attack vs PD; 2d6+1; plus +2d6 and Reduced Negation: 10 Only vs Cthonic Horrors. 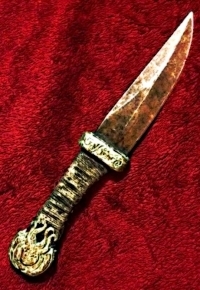 The Dagger is considered to be a Forbidden Knowledge; "learning" it consists of picking it up and holding it. Those failing their roll drop it as if shocked. Isn't It So Very Precious? : Anyone with the Dagger in their hand must make a EGO Roll at -3 to relinquish it to someone else. Less obvious, the remains of another human are slumped against the far wall, as if flung across the room by an incredibly powerful backhand. Many of the bones of this skeleton are pulverized, including the back of the skull. A rotting leather strap and satchel still adorns the remains; the satchel contains a very disturbing book...the Tome of Bainbriar Thost. The Tome is cryptic and mind-bending and is a Forbidden Knowledge. It contains information that can help the Hunters leave this doomed place...it describes the properties and operation of the Heart Stone. 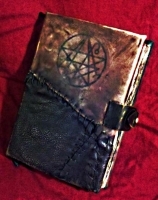 The Tome of Bainbriar Thost is the journal / madman diary of a planar traveler to whom the Heart Stone once belonged. The journal details the Heart Stone and how to activate it by whispering mystical secrets to it. 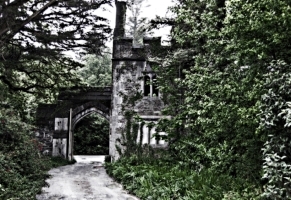 There is nothing else of interest in the gatehouse but after the Hunters have had a few minutes to assure themselves of that, the more alert among them hear a disturbing lumbering sound. A Uarg'roth (which strongly resembles the monstrous skeleton in the gatehouse) has caught their scent and is running towards the gate house at great speed. Uarg'roths are quite fast, particularly for something so large, so presumably a fight ensues. At a critical moment in the ensuing combat, Mallory Keene manifests, as a spectre streaking towards the gatehouse from the east (the direction of the not visible graveyard). She assaults the Uarg'roth immediately with furious vengeance. If the Hunters were struggling, just have her kill the thing; otherwise she just assists. Once the Uarg'roth is taken care of, Mallory engages the Hunters in conversation. After any necessary chit chat she will tell the Hunters that there is something they must know or else almost certainly fail. 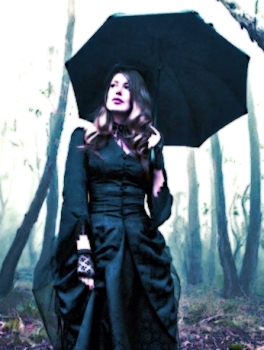 She asks that they accompany her to the nearby estate graveyard where she will show them what they need to know. Mallory does inform the Hunters that there it will be dangerous, but assures them that the risk is necessary and that she will aid them. The Hunters need to meet Mallory Keene before they go to the Manor house itself, and the combat with the Uarg'roth is a pretext for that. If the Hunters attempt to flee the creature, box them in with Krythoths coming from the other direction. If the Hunters somehow skip the Gatehouse entirely, you need to contrive some other means for them to encounter Mallory. The Wurzelhoffen family live upon this estate for several generations, and many of their dead were buried here. A faint trail snakes off the Manor house road inside the Gatehouse and winds back behind a screen of trees and branches. At the end of the trail is a gated family plot as one might expect. However, there are also some things that one might not expect. For starters, a Spawn Portal is perched atop a column in front of the cemetary's gate. Secondly the area is infested with 1d6+1 Bryr'thepts. Finally, the remains of what appear to have been an epic battle are strewn on either side of the path. There look to be nine or ten skeletons. Mallory tells the Hunters a sad tale of woe. Eight of the remaining adventurers made it this far, and were coming to the graveyard to disintere the remains of Nikolai's dead wife with the intent of resurrecting her. The thought being that if they could provide Nikolai with what he claimed to want most he would give up his mad seeking for ever more powers and willingness to make impossible bargains with his Cthonic masters. The crazy plan might have even worked, but Nikolai dropped the hammer on the adventurers here, coming himself with a coeterie of Cthonic minions. Nikolai and his servants made quick work of most of the adventurers. However Nikolai was slain by the leader of his adversaries, a man named Jules Ablefors, who had placed a death curse upon himself that was unleashed when Nikolai struck him down. The Death Curse should have slain Nikolai outright, but he was protected by his Cthonic masters. However Nikolai is still affected by the curse, and is vulernable to any aspect of Jules Ablefors' spirit or magic. Nikolai can't even come near to Jules' remains as the Curse is strongest near them. Nikolai has attempted to have his Cthonic minions retreive and destroy the remains of Jules, but Mallory chases them off and thus they lie where Jules fell here in front of the cemetary. Mallory herself was killed in a blast of eldritch forces, but she was carrying the phylactery that would have been used to bring back Nikolai's wife. The phylactery was fractured by the blast that killed her, and it's powerful magics inadvertantly granted Mallory a form of life after death when they leaked out. She is both living and dead, and goes through cycles of inertness, lucidity, and insanity. Her price for helping the Hunters is that they destroy the phylactery once and for all, freeing her from the endless cycle of life, death, and a confused middle state. The phylactery can be destroyed without too much effort, but Mallory is unable to interact with it due to the nature of her existence. Assuming the Hunters agree, she will show them which remains were Jules' and will instruct them to take some bones to weaken Nikolai with. Finally Mallory will also provide the Hunters with Forbidden Knowledge by whispering a mystic secret in one of their ear's. She'll pick whichever Hunter she has observed being noble and proper and behaving as a gentleman ought to; baring that she tells the one with the highest PRE (break ties with a PRE Roll-off, including striking appearance and similar abilities). Act 3 is, under most circumstances, short and to the point...unless the Hunters get bogged down in combat. The basic premise is the Hunters arrive at Nikolai's Manor and enter it, skulk or bang about a bit, and finally encounter Nikolai. Roleplaying ensues, most likely followed by an epic battle. Assuming the Hunters acquired Jules Ablefors' remains, the combat should be tough but winnable. Nikolai Wurzelhoffen lives in his dillapidated manor house perched atop the edge of a bluff dropping off to a river that runs down to the black-water lake of the Stone Door. The Manor is a three story stone and wrought iron Victorian-esque pile which seems to have been custom built to moulder for centuries, fronted by a protruding tower on a half-floor basalt pedestal. There is also a cobweb filled basement. Nikolai spends most of his time in a cramped and creepy office on the upper floor of the tower and it is assumed that he encounters the Hunters when they find him here. However if it is more dramatically appropriate, Nikolai might make a bold reveal of himself from the top of the grand staircase that frames the entrance foyer. Use your discretion; this will prevent the Hunters from exploring the Manor and might make them feel like the story is on rails, but on the other hand it is more expedient and perhaps more narratively satisfying and might save a wasted hour or so of paranoid skulking. 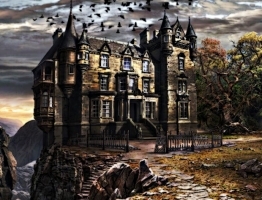 The manor is creepy and musty, and has some odd dark sorceror accoutrements such as Nikolai's alchemical laboratory on the first floor, but is not outre in any way (though, of course, a GM is free to let their muse strike and Lovecraft the place up a bit). All of the Cthonic monsters in the vicinity of the Manor are subject to Nikolai's direct control. At this point in the adventure, you should judge your player's mood carefully, and other details like time left on the clock for the session, and also the risk that the Hunters wont succeed and will become trapped in this doomed dimension...which prolongs the vignette at best and effectively results in a full on Total Party Kill at worst. If glorious Cthonic monster slaying combat is the order of the day, go wild. Throw as many Cthonic creatures as you like at the Hunters, and feel free to make up your own crazy things, swipe things out of the bestiary and add tentacles to it, whatever. Go for it. Add one or more Cthoinic Spawn Portals to the area and let the dice fall where they may. On the other hand if the Hunters have had enough combat and just want to go home already and take a long Cthonic-slime cleansing decontaminating shower, feel free to have Act 3 just consist of Nikolai and go dramatic encounterish vs dice stormish. 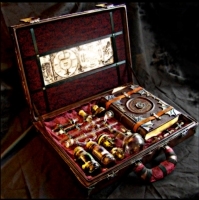 Amidst the general clutter, encased in a glass case with brass fittings and a hinged door on a pedastal next to Nikolai's desk is is a disturbing to look upon reddish stone enscribed with writhing sigils. 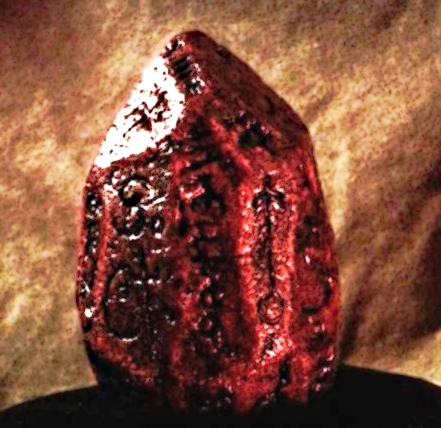 To supernaturally aware eyes, this glistening red stone ensconed in the Manor Tower glows with powerful, warm to the point of burning, emanations. Those with appropriate Lore can tell that it is a keystone to unlock the ways to other dimensions. Those who recovered and read the Tome of Bainbriar Thost will also recognize it immediately as the Heart Stone. The various elements of Forbidden Knowledge that can be found during the vignette provide the knowledge to activate the keystone with. Attempting to use it without proper knowledge is very dangerous. A character who wants to activate the stone whispers mystical secrets to it and then makes a Presense Attack against it using just their base PRE, +3d6 for each individual Forbidden Knowledge that person has gained. It requires 30 effect to activate the Heart Stone. On a failed attempt, the attempting character suffers STUN equal to the difference by which they failed and suffers 1d3 EGO and INT damage. Do the Hunters keep the Heart Stone? If you want to take your campaign into a dimension-hopping direction, allow the Hunters to keep the Heart Stone and take it home when they escape the dimension. Otherwise, it stays where they found it. You'll want to decide how you want this to go before it comes in play, so you may want to think it through before you start the session. If the GM has any miscellaneous weird stuff or items of importance that they want to interject, there's plenty of clutter and pervasive magical background noise to cover the addition of such items as desired. However, for purposes of the main adventure path only the Heart Stone is of significance in Act 3. The "happy path" end state is that the Hunters discover the necessary Forbidden Knowledges, close or ward off the spawn portals, destroy any Cthonic things that get in their way, ascend to the tower, bypass or defeat Nikolai, activate the keystone, and return home. All other paths are less "happy", up to and including a failure to escape, death, insanity, mutation, and other less pleasant fates. One option to add a little adventure game incentive to the scenario is to "score" the play as a mini-game. If you do this, give the players the score sheet at the beginning of Act 2. In addition to the extra edge some healthy competition can add, it also effectively incentivizes the players to seek out the hidden Forbidden Knowledge items, confront the spawn portals, and so forth which can help keep the game from bogging down into inaction or confusion. The Hunters easily defeat or destroy Nikolai, blow up the manor or otherwise make a statement, return to their own dimension, and perhaps even find a way to destroy the Mirror once and for all. The Hunters escape back to their world, but they are pursued by an alien tentacle thing (or things) from the otherside, and an epic final battle occurs to prevent the horror from running amok in the "real" world. As this is an "ambush" scenario, the Hunters have little choice to not "take the bait". However, a different challenge presents itself in that if the Hunters cannot escape the dimension, they may be done for or require some deus ex machina to be rescued. This has the potential to be a Total Party Kill (TPK) event. It is entirely possible that a new Hunter has been trapped in the alternate dimension, or is from there, or is from still yet some other dimension, and escapes with the Hunters. It is also possible that, if the Hunters get into trouble and can't figure it out or otherwise extricate themselves, a specialist Hunter could be introduced who has the knowledge and skills to save the Hunters.